The Paine's highly anticipated exhibition, Louis Comfort Tiffany: Treasures from the Driehaus Collection, is on view to the public through Sunday, September 23. 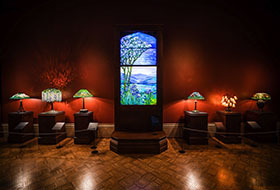 This exhibition presents more than 60 works from Louis Comfort Tiffany's primary artistic production: stained glass windows, lamps, vases, furnishings and accessories. The objects reflect the best of Tiffany's technical brilliance, endless creativity and inspiration from nature. 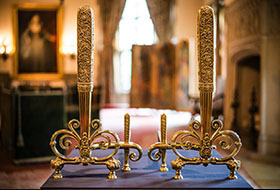 The exhibition also represents the culmination of businessman and philanthropist Richard H. Driehaus's 35 years of collecting the artist's work. 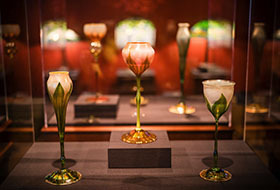 His passion has resulted in a collection of more than 1,500 objects created by Tiffany's various workshops and firms. For the first time, a selection from this distinctive collection is being exhibited nationally. 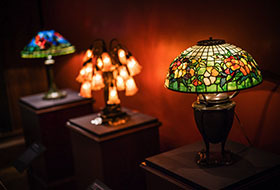 In addition to the main exhibition, 15 extraordinary Tiffany lamps from the Paine's collection and regional private collections are presented throughout the rooms of the historic mansion. 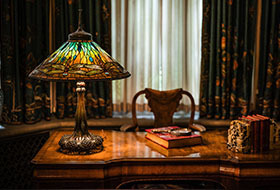 Displaying the lamps within domestic settings, as Tiffany intended, illustrates the artist's desire to bring beauty into American homes. Community First Credit Union is the lead sponsor of the exhibition. The partnering sponsor is the Kaldas Center for Fertility, Surgery & Pregnancy. 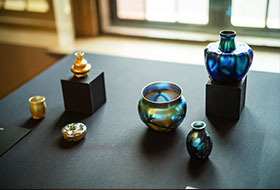 The exhibition was organized by the Richard H. Driehaus Museum and is toured by International Arts & Artists, Washington, D.C. Banner image: Tiffany Studios, Garden Landscape Window, 1900-1910, leaded glass. Photograph by John Faier. © 2013 Driehaus Museum. The Paine is located at 1410 Algoma Boulevard in Oshkosh, Wisconsin. Visitors may park in a new parking lot on Algoma Boulevard located next to the Paine mansion, which offers accessible parking spaces and a drop off area near the entrance gate. Join as a Member now and receive free admission to the Tiffany exhibition as well as benefits for an entire year. The Oshkosh Public Museum, across the street from the Paine, features an authentic, large-scale Tiffany window. The landscape-themed stained glass window was recently relit with LED backlighting, and it now looks more magnificent than ever. Receive $2 off regular admission to the Oshkosh Public Museum by showing your paid admission receipt to the Paine. Members of the Paine also receive $2 off regular admission. Offer valid from June 23 to September 23, 2018.